A couple of users lauded the outsole of The North Face Thermoball Versa. They liked its grip, especially on icy surfaces. A handful of wearers praised the comfort that this boot offered them. A majority of hikers were amazed at the warmth that the two Primaloft components granted. The lightness of the Thermoball Versa was well-loved by a couple of fans. Scores of online purchasers appreciated the great fit of the boots. Some owners shared that the Thermoball was so wearable that it became their all-around footwear. A few unimpressed wearers were not happy about their feet getting soaked despite the waterproof claims of the maker. Less than a handful of buyers said that the boot was not breathable. This hiker impressed users by delivering multiple aspects of comfort and the necessary performance features required in winter hikes. The brand’s excellent insulating technology and fit were recognized. However, the waterproofness and breathability of the boot were reportedly underperforming. In conclusion, hikers who wish to endure colder trips with warmth, comfort and style will appreciate The North Face’s Thermoball Versa. Shoes or boots for hikes that only last for half a day. Flexibility and lightness are the highlights of these kinds of footwear. See the best day hiking shoes and the best day hiking boots. Designed for users who want to cover a greater distance by going fast, usually with a light pack. See speed hiking shoes. Boots that grant insulation to the user during hikes. See winter hiking boots. Mainly sandals. Aside from hiking they can be used for other purposes such as water activities. See multi-sport hiking sandals. Casual hikers can choose day hiking footwear or multi-sport sandals. More info here. Shoes with a cuff that goes below the ankle. See low-cut hiking shoes. Boots with an ankle-height cuff. They provide extra ankle support. See mid-cut hiking boots and mid-cut mountaineering boots. Boots with a cuff that goes above the ankle. In the case of insulated ones, they may reach the calf. Also grants extra ankle support. See high-cut hiking boots and high-cut mountaineering boots. Generally, for trails that are easy to tackle, go with low-cut shoes. Go mid to high if there are more trail obstacles. Experts are hikers, who post reviews at youtube, directly at RunRepeat or at their own websites. Each expert is categorized from level 1 to level 5 based on expertise. See stats on expert reviews and how we calculate scores here. The waterproof and insulated Versa Boots were a life-saver, keeping my feet warm and dry as we made our away around town, trudging through wet snow. I’ve been able to enjoy cozy warmth in these weatherproof boots everywhere I’ve taken them. The North Face Thermoball Versa has components that make hiking through wet snow more bearable. It comes with rubberized hardware to grant durability. It also features a waterproof, full-grain leather upper for protection against the elements. Warmth is delivered by two Primaloft components, one in the collar and another in the vamp. The injection-molded sole is responsible for cushioning and traction. Underneath this unit are temperature-sensitive lugs called IcePick. 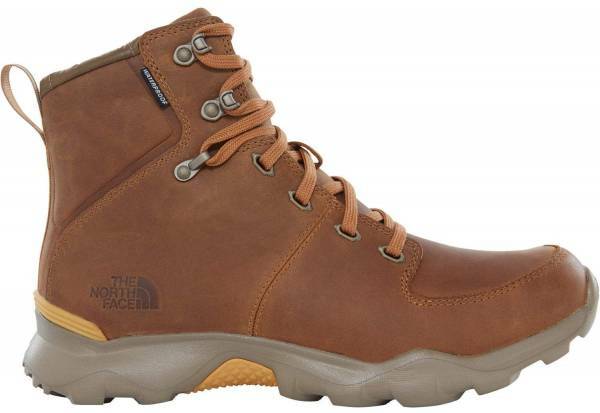 A mid-cut winter hiking boot for men is The North Face Thermoball Versa. It reasonably runs true to size. It is offered in standard width and lengths. Its closure is a lace-up type which grants a snug fit. The proprietary IcePick lugs harden as the temperature decreases. This set of components work with the EVA outsole to deliver traction when tackling slippery and icy ground. The front tip of the unit forms a bumper that shields the toes during accidental knocks. There are chevron patterns at the front and rear to aid during uphill and downhill maneuvers. The EVA midsole provides ample cushioning. Sitting atop this unit is an OrthoLite Rebound footbed that offers long-term cushioning. The North Face Thermoball Versa features a full-grain leather upper. The material has a waterproof construction to prevent wet elements from entering the boot. What keeps the users warm during cold-weather hikes are PrimaLoft ThermoBall synthetic insulation and 100 g PrimaLoft Silver Insulation Eco, placed in the collar and vamp (the front part of the upper), respectively. Thermoball works by trapping heat inside tiny air pockets to keep the warmth. On the other hand, PrimaLoft Silver Insulation Eco delivers instant warmth in a lightweight package, ultimately granting comfort to the user in wet conditions. The front closure consists of a lace keeper on the tongue, combination eyelets (which includes grommets and hooks) and a flat synthetic lace. A pull tab at the back helps quicken on and off. Thermoball is an insulation technology co-developed by The North Face and Primaloft.